The first half of the year has gone by in a flash. It has been a great year…Price Harry finally got married, Star Wars fans got another movie and real estate has been the thing everyone in Chattanooga has been talking about. The first half of 2018 has seen an increase of multiple offer situations as the predicted surge of millennials dipping their toes into finally buying a home came to fruition. With new construction slowly climbing out of the sever decline of the recession, home buyers and sellers are in a stalemate of both needing more inventory in the Chattanooga market. Here’s the breakdown of the first half of 2018. If you have spoken with a real estate agent (and chances are you have, there are nearly 2,000 in Chattanooga as of June 1), you have heard about the low inventory of homes. Chattanooga and North Georgia have enough listings to last 3 months if new ones are not added to the market. To give some comparison, two years ago agents were concerned when there were 5 months of inventory to sell. While listings are up .6% for the first 6 months of 2018 compared to the first half of 2017, that is not enough of a difference to ease the demand. Is it a seller’s market? Yes and no. 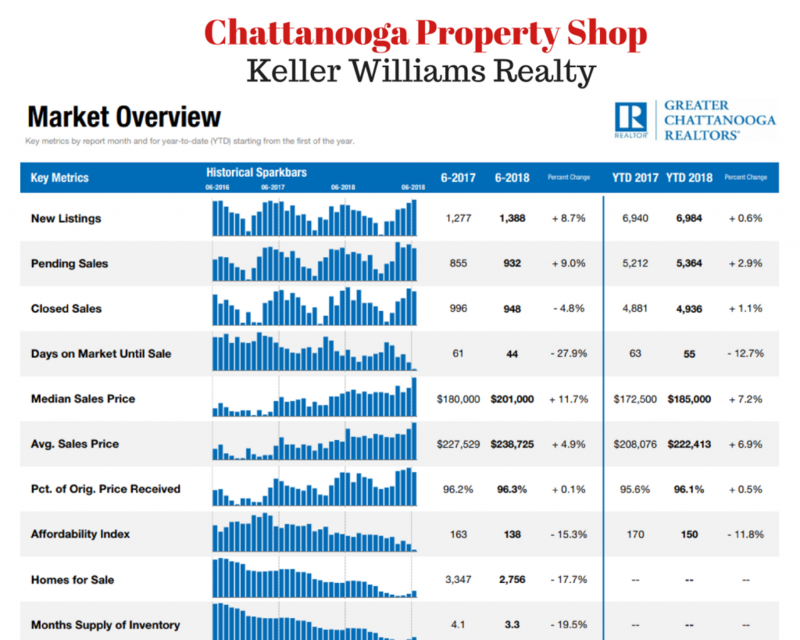 The 2018 Chattanooga real estate market is a seller’s market. Sellers are averaging 96.1% of their asking price. Win! But that does not mean that homes are selling at pre-crash prices. Lenders are not approving loans for more than the appraised value and appraisers are being conservative. Why? Precisely to prevent what happened in 2013. As every real estate agent worth their salt will tell you, three things dictate how fast a home sells. Location, condition and price. If a home is not selling and the location is great, the condition is good, then the price is too high. Two out of three things can be changed. Asking too much for a home just because the market is tight is not a savvy move. As I mentioned before, we are seeing record multi-offer situations for homes in the median price range of $150,000-250,000. Homes are going under contract in days and even hours, instead of months if they are priced correctly. The year to date average of days on market is down 12.7% from 2017 to just 55 days. The month of June saw a drop of nearly 30% to just 44 days. This is the lowest in over a decade. Again, the average includes homes in all price ranges, but the homes that are selling the fastest are home under $300,000. The average sales price in Chattanooga continues to rise, but not as quickly as it did the last few years. For a little clarity, 2016 saw a 10.5% increase in sales price from the previous year and the year to date increase over 2017 is just 6.9%. Fewer homes on the market does increase demand, but it also decreases sales. If a potential buyer has seen everything in their price range, they are not buying, choosing instead to wait. The stalemate between buyers and sellers could continue to grow until more new construction homes hit the market or more inventory is available. Home prices are predicted to only rise at normal rates for the rest of the year. Whether you are searching for a new home, trying to determine if it is time to sell, or just want to remain “in the know” about how your investment is fairing in today’s market, we have the knowledge and experience to help you remain educated. Have questions, we are here to help. Give us a call.